On this page we gather NAVY BLUE handbags and jewelry, darker blues that have names like indigo, midnight, royal and cobalt. It is a neutral basic along with black, brown, ivory and white...but this one always looks great year-round! 2 inches long on sterling earwire, 3/8 inch across. Geometric shapes trail delicately in shades of navy, denim and ice blue. 1-1/2 inches long on sterling earwire, 1/4 inch across. 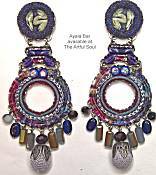 Narrow almond-shaped oval is dark navy with green glinting through, navy beads dangling below. 2-1/8 inches long on sterling earwire, 7/16 inch across. A pair of gracefully curved metal pieces are joined to form the birdwing motif. Background is lightly etched in indigo blue, the smaller on top is dark navy with black mottling, a navy blue glass cabochon rests in the center. Rich with color of glasslike jeweler's resin, this bangle has oval shape, hardware in gold vermeil (18kt gold over sterling). Hinged for easy on-off (hinge stays under wrist), and magnets in the ends help keep it closed. Measures 2-3/8 inches across, 1-3/4 inches deep, for small to medium wrist. 1/2 inch wide and rounded top surface. The color is translucent dark navy blue. Rich with color of glasslike jeweler's resin, this bangle has oval shape, hardware in gold vermeil (18kt gold over sterling). Hinged for easy on-off (hinge stays under wrist), and magnets in the ends help keep it closed. Measures 2-3/8 inches across, 1-3/4 inches deep, for small to medium wrist. 1/2 inch wide and rounded top surface. The color is translucent bright royal blue. Twisting lifesaver links are intertwined into a lightweight classic earring. Glasslike jeweler's resin forms two of the loops, at center is a gold vermeil one (18kt gold on sterling). 1-7/8 inches long, 7/8 inch across, a surgical post is located at the very top. The color is translucent dark navy blue. Twisting lifesaver links are intertwined into a lightweight classic earring. Glasslike jeweler's resin forms two of the loops, at center is a gold vermeil one (18kt gold on sterling). 1-7/8 inches long, 7/8 inch across, a surgical post is located at the very top. The color is translucent bright royal blue. 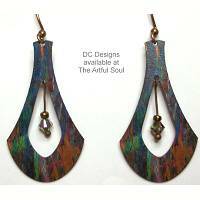 By The Artful Soul, this is part of a navy blue geometrics polymer clay collection, indigo and denim, tan and white. Detailed handbuilt patterns are sliced and mounted onto background clay, accented with gold leaf, then fired. Light and artful. 2-1/4 inches long on surgical earwire, 5/8 inch across. 1-1/4 inch earrings have surgical post located 3/8 inch below top edge. 3 polymer clay pieces adorn center, longest is 2 inches. 25 inch necklace has goldplated toggle clasp, beaded with vintage Czech glass, sodalite gemstones, mother-of-pearl, glass seed beads. Necklace has 7 clay pieces curving across 5-1/2 inches of front, 1-1/8 inch tall at center, and suspended from beads that include vintage Czech glass, Swarovski crystal and seed beads. Goldfill chain in back, lobster clasp, 18 inches long. 7/8 x 1-1/2 inch pin has barpin clasp to be worn best at angle shown. 2-1/4 x 1-1/8 inch pin has barpin clasp to be worn best at angle shown. Pattern collage at top introduces colors along with the cobalt blue, dual jump rings hold larger element below that has another print under glass along with blue metal coil and bluish mesh chain ring. Hanging under this are more prints under glass with dancing crystal fringe. Colored porcelain in puffy 5/8 inch square has CLIP ON back for all ears. Baba colors are denim and indigo blue with red spots. 1-1/2 inches long including sterling earwires, 3/4 inch across. Teardrop convex metal shape, lightweight, glimmering white backing. The artwork depicts an amazing bolt of white lightning on midnight blue background. 2 inches long including sterling earwires, 9/16 inch across. Leaf-shaped convex metal shape, lightweight, glimmering white backing. The artwork depicts Van Gogh's Starry Night in deep blues with yellow swirls. 1-1/2 inches long including sterling earwires, 3/4 inch across. Teardrop convex metal shape, lightweight, glimmering white backing. The artwork depicts The Great Wave woodblock print in blue and white. 1-3/4 inches long including sterling earwires, 3/8 inch across. Slender leaf-shaped convex metal shape, lightweight, glimmering white backing. The artwork is a snippet from Van Gogh's "Starry Night" painting in swirls of dark blues and light yellows.